Most commercial Floor Drains look the same from above. Usually, a simple grate covers hole or trough that funnels water to the buildings drainage system. But just because two Drains look similar does not mean they work the same. Take Sani-Floor’s Clog-Free Strainer Technology, for example. 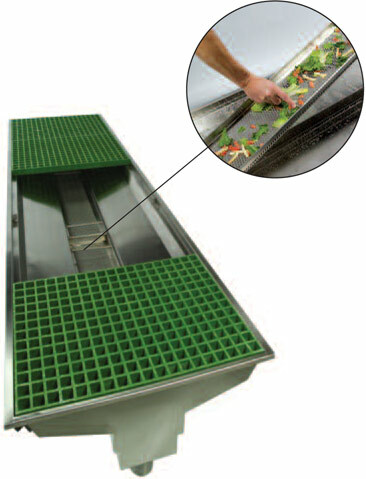 Unlike traditional Floor Troughs that have a 6-inch diameter strainer basket, our high-capacity strainer tray run, the full length or width of the trough. This increased strainer area eliminates dams or clogs that stop the flow of water. Ask any local plumber about the most common commercial plumbing complaints. We are confident that clogged Floor Drains will beat the top of the list. If you have been in business for more than a few years, you probably already know this to be true. Fortunately, the technology at Sani Floor offers foolproof solutions. Self-Washing Trough Technology is even patented. Plus, these look troughs can be customized to fit your business needs. Pick from our three Floor Through model and then select the size and style you require. We can adapt the technology to fit your kitchen without any unnecessary hassles. Are you tired of wet kitchen floors and clogged, unsanitary Drains? Take your business to the next level. Whether you are building a new business space or renovating an old one, our commercial Floor Drains are the perfect addition. To learn more about our product and discuss your needs with our sales rep, give us a call. We can be reached at 231-599-2930. Alternatively, send an email to our support staff at info@747.4ea.myftpupload.com. We are located in Ellsworth, MI, but service businesses with our technology worldwide. Just reach out and we can get the process started.